Toddler Blog – The Massive Mass of a Humphead Wrasse! Today was our final Toddler Tuesday session before we all go off to have fun, fintastic adventures over the summer holidays! To celebrate we learnt all about one of the most famous fish in the Aquarium, Cooper the Humphead wrasse! We learnt all about how ginormous Cooper can grow, what he likes to eat and looked at the wonderful patterns on his scales. Armed with our colour changing looking glasses we went to our Great Barrier Reef tank to go and find Cooper and his girlfriend Mini! After having a good look at all the crazy, colourful fish in the tank we went back up to the café to play some games and then painted some fishy fridge magnets! We had a whale of a time for our last session! Humphead Wrasse can grow to over 2 meters long, that’s the same length as a king sized bed and they can live to be 30 years old! Even though Cooper is a boy now, when he was born he would have been born a girl! All wrasse are born girls and then some of them turn into boys when they grow up! 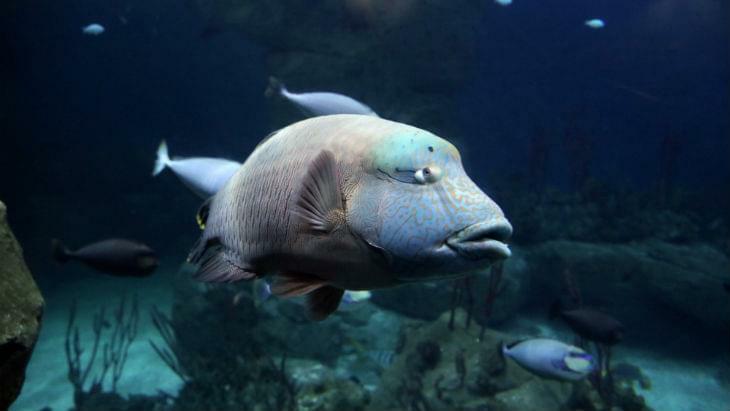 Humphead wrasse love to eat fish, starfish and shellfish but they can also eat many animals which are toxic to other animals! One of these toxic animals is the crown-of-thorns starfish which actually destroys coral reefs, so by eating them Humphead wrasse are helping to protect the reefs! Toddler Tuesdays will be back after the summer holidays with the first session on September 4th, have a wonderful summer and we will see you soon!